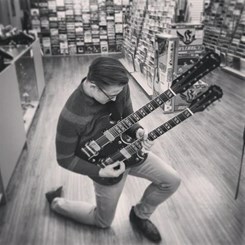 My name is Joe Musselman and I am currently the senior sales associate as well as guitar specialist here in our Woodbridge M&A! I was introduced to the performing arts in musical theatre and from there I've dedicated a majority of my time to guitar playing. I'm able to help you out with anything from renting you an instrument, to setting you up for lessons with one of our fantastic teachers to helping you find the best insturment possible for you to improve your playing skills.